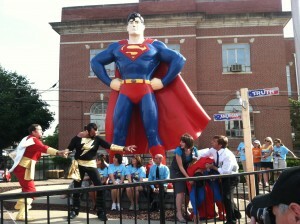 Hey, gang- sorry for the delays in updates. Have a few art deadlines I’m trying to make, but hope to have more frequent updates this month. 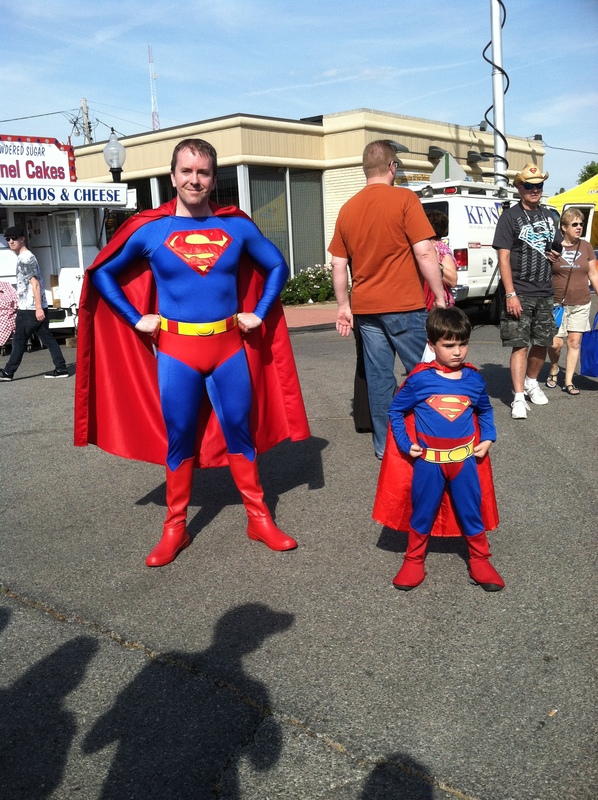 Don’t forget I have a Facebook page and update it frequently, as well as do Twitter tweets (@Have_Geek) on a regular basis. Since yesterday was Independence Day, I thought I’d update HGWT with another day at the 34th annual Superman Celebration in Metropolis, IL and their very patriotic opening ceremonies on Thursday, June 7th. 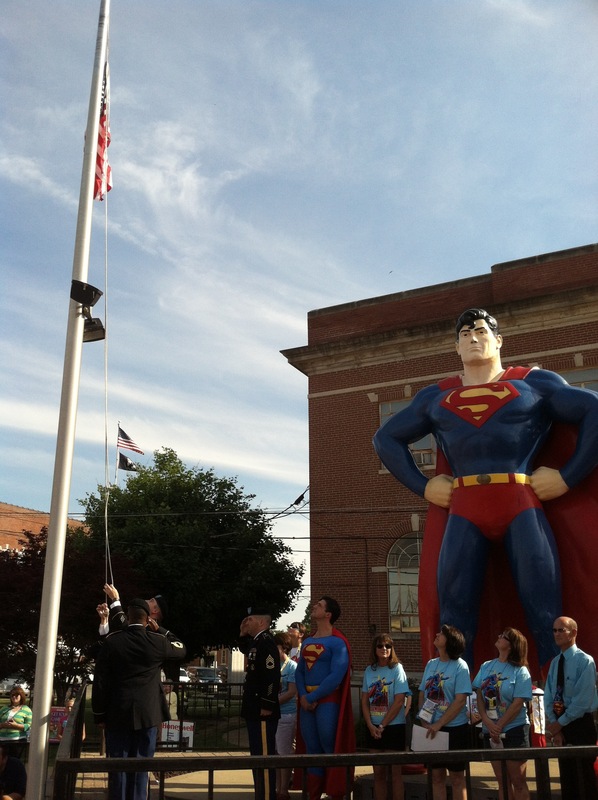 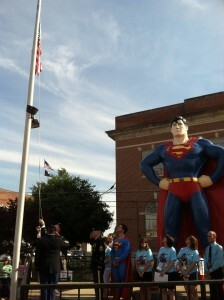 This Superman Celebration marked the 40th anniversary of Superman adopting Metropolis, IL as his official home town. 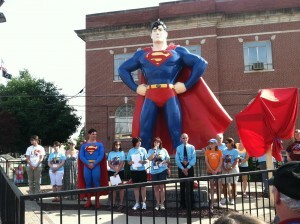 Around 5pm many of us gathered in front of the Superman statue on the south end of Market Street across from the Supermuseum and main tent. 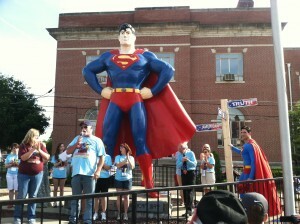 Soon Josh Boultinghouse- the official Superman of Metropolis arrived and headed around the back of the statue. 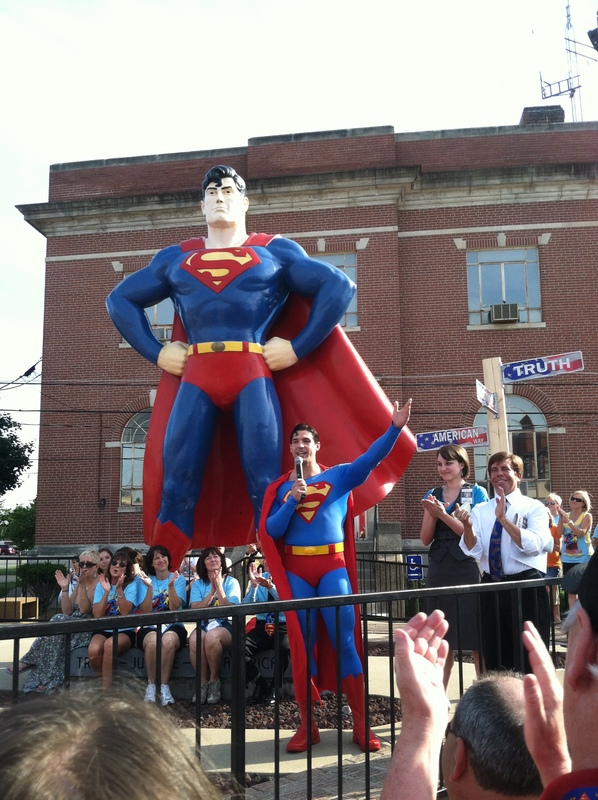 Josh joined Superman Celebration co-chairs Lisa Gower and Karla Ogle (with mic), Mayor Billy McDaniel, and many of the event staff in front of the statue. 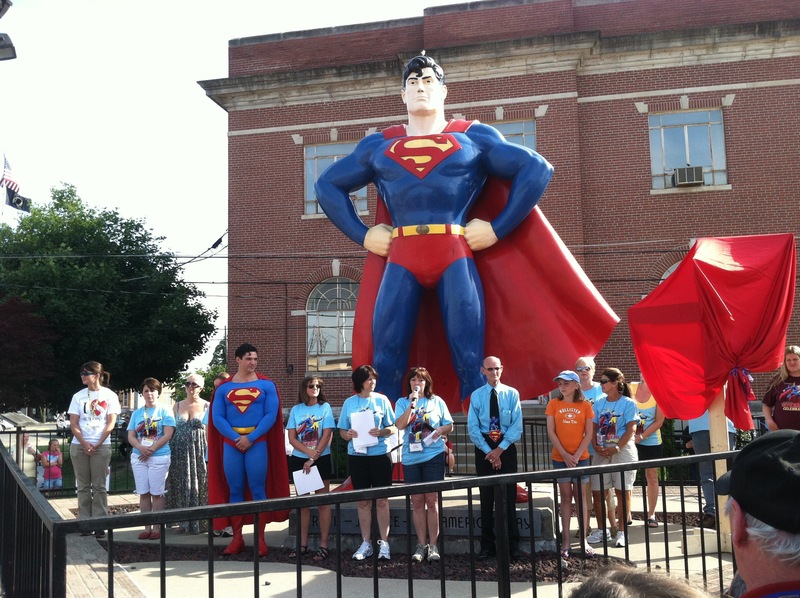 Karla welcomed everyone to Metropolis and began to tell us of one person who couldn’t make it to the celebration this year, but sent something to be shared with the attendees and citizens of Metropolis. 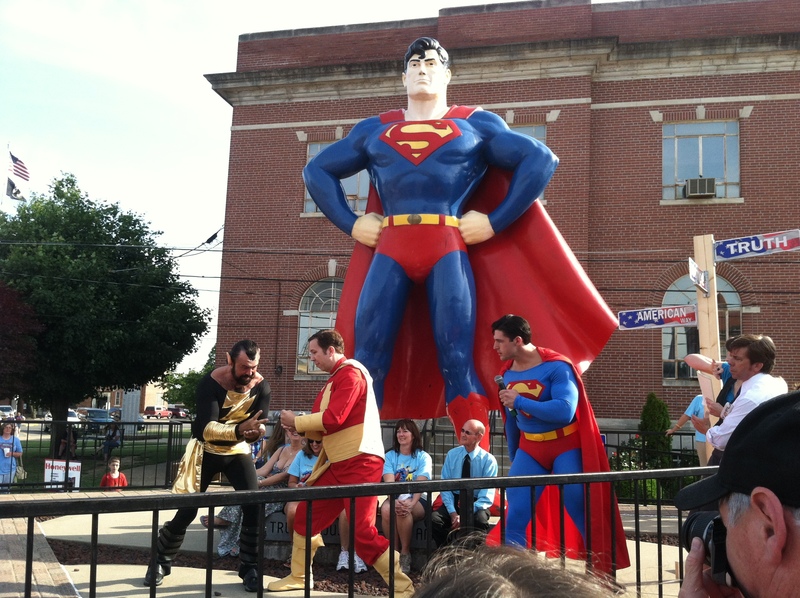 After Mayor Billy led the crowd in a prayer, Jim Hambrick– owner of the Supermuseum, and his daughter announced the renaming of three streets in Metropolis. “Truth, Justice, American Way” street signs were revealed by the mayor and Superman. The “American Way” signs are now on 5th Street, which is the street that runs past the big welcome sign, Metropolis Planet newspaper, Massac Theatre, and the courthouse behind the Superman statue. Soon it was time for the annual opening skit. 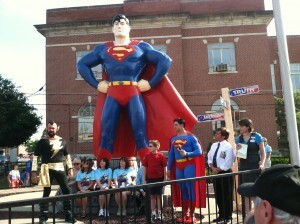 Superman was joined by Perry White, Lois Lane, and Billy Batson- winner of an essay contest. 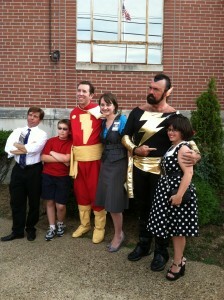 Black Adam immediately crashed the party and was up to no good as usual! To keep from having any collateral damage during their battle they decided to settle their differences with a game of “rock, paper, scissors“. While Captain Marvel and Black Adam went off to see who won best 3 out of 5, Superman announced that the Superman Celebration had officially begun! Here’s the gang from the skit- (L-R) Steve Kirk, Noah Gleckler, John Gleckler, Michelle Lyzenga, and Dough Hubler. 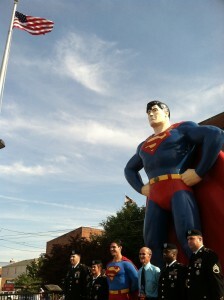 They all did a great job! After the opening ceremonies I headed back up the street to Artists Alley and Writers Way and encountered many more Supermen along the way! 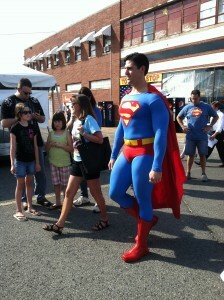 Next up I’ll share some shots from day two, Artists Alley and Writers Way, and more costumers!